As we know the Marketing Mix (made up of the four elements product, price, place and promotion), is the foundation for effective marketing. In this article we discuss common product decisions and how to maximise the product element of the marketing mix. When firms decide to market products there are many decisions to make; each decision can have a long term impact on the success of the product. Market research at the beginning of the marketing process will help firms make many product decisions including Product Development, Target Market and Pricing. The design of a product can often be the thing that sells it, as design is the easiest thing for consumers to identify. 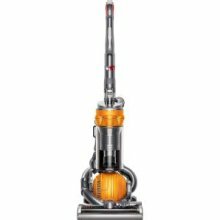 Product design is key in the technology sector, examples include the iPad, the Volkswagen Beetle (1997 - 2011) the Dyson Ball vacuum cleaner and design of the Tesla car. (pictured below). Product design will be dictated by your target market. For example bright colours may be chosen to attract children, pink and pastel colours for female adults and dark colours such as black, navy, charcoal for male adults. Whereas consumers above a certain age may prefer design features that make a product easier to use rather than a design which is purely about aesthetics. What features will you add to increase the benefits offered to your target market? Click this link link for more information Marketing Definition. A quality product is difficult to define as it will mean different things to each consumer. The challenge for all firms is to set their quality level and ensure that it meets the expectations of their target market. In general quality is made up of tangible features (features that can be seen) e.g. performance, appearance, strength and intangible features such as reputation and exclusivity. In all circumstances a product's quality should be consistent with other elements of the marketing mix. Philip Kotler in his book "Principles of Marketing" devised a very interesting concept of benefit building with a product. Kotler suggested that a product should be viewed on three levels. Level 1: Core Product, What is the core benefit your product offers? For example customers who purchase a camera are buying more than just a camera, they are purchasing memories. Level 2: Actual Product, All cameras capture memories, therefore your aim is to persuade them to capture memories with your camera. The strategy at this level is to add branding, features and benefits which offer a differential advantage over your competitors. Level 3: Augmented Product, This level is about exploring if there are any additional non-tangible benefits you can offer. Competition at this level is based around after sales service, warranties, delivery and so on. For example John Lewis a retail department store offers a free five year guarantee with television purchases. A five year guarantee offers their customers peace of mind that their television will be repaired or replaced should a fault develop. One of the most important decisions a marketing manager can make is branding for their product. The value of brands in today’s environment is phenomenal. Brands have the power of instant sales, they convey a message of confidence, quality and reliability to their target market. A brand is a tool which is used by an organisation to differentiate itself from competitors. Ask yourself what is the value of a pair of Nike trainers without the brand or the logo? How does your perception change? Or an Apple phone, without their logo? Successful brands are managed by dedicated brand managers tasked with growing and protecting the brand. There are many examples of firms bringing legal action against anybody that they feel is infringing their branding and the intellectual property rights associated with it. Product branding has to work across all of the firm's trading and promotion platforms including retail shops, telephone, television and of course the internet. Internet product branding should support your brand strategy. Your product's internet branding should be easy on the eye and make the most of any brand loyalty you have build via other sources .A firm's internet website should sell its products to consumers making the most of the convenience offered by the internet. For more information about the e-marketing mix click here. 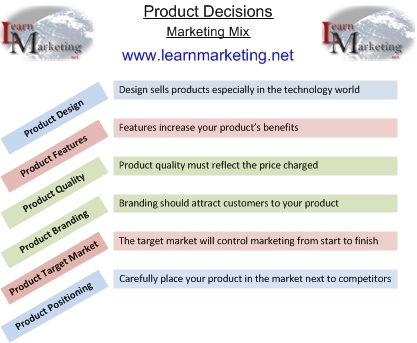 As we have seen there are many product decisions that firms need to make, each of these decisions should take into account the other elements of the marketing mix. For example product decisions such as product design and features could push up the price that need to be charged under the price element of the marketing mix.